List your Blue Mountain rental home on the front page of this lodging directory for FREE! This Blue Mountain, Ontario lodging service will help you boost your bookings from ALL of your current marketing channels AND will create a new and distinct Blue Mountain specific reservation channel and community for accommodation businesses like you. We have been helping Whistler, Big White & Sun Peaks Owners and independent small accommodation businesses succeed online since 1997. They are among the most commercially successful lodging businesses in their community. We can do the same for you! 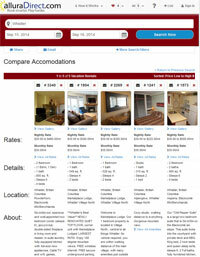 Useful Blue Mountain Vacation Rental Maps - View Blue Mountain accommodation.